Labour members at party conference this year will be able to attend the largest UK political festival held for decades. The World Transformed is set to double in size, making it bigger than Labour Live and previous Momentum events. The party conference fringe in September will include political, musical and cultural events put on over four days across Liverpool’s Baltic Triangle. Left-wing figures such as John McDonnell, Dan Carden MP, Class think tank director Faiza Shaheen and Novara Media’s Ash Sarkar will join political thinkers Leo Panitch, Chantal Mouffe and more. Speakers will engage with policy areas from migration and policing to Brexit and international affairs, with a focus on how to build a social movement while tackling the challenges faced by the Labour Party before the next general election. Described by Jeremy Corbyn as “exciting and inspiring”, The World Transformed grew out of the same movement as Momentum and has been running alongside party conference since 2016. Last year it attracted around 5,000 people and held over 70 workshops, discussions and music events. 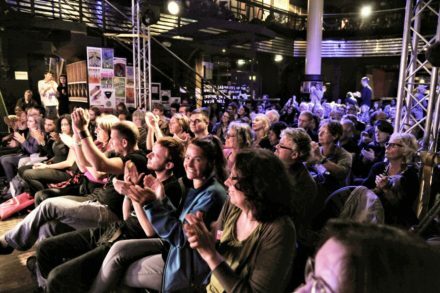 Commenting on TWT 2018, Corbyn said: “In 2016 and 2017, the festival provided space for people to share ideas, debate politics, have fun and expand our horizons with creativity, music and culture. This year’s is expected to be twice as large. The World Transformed organiser Fergal O’Dwyer said: “The last two years have shown there is a hunger in Britain for a different kind of politics and a new society; one that takes power from the establishment and puts it into the hands of the many. “With twice the capacity and hundreds more speakers and sessions, The World Transformed 2018 will the largest political festival in the UK for decades and will debate the new socialist policies that could end up in the next manifesto. “This year there will be a focus on how we build socialism from below, and how we empower activists to make concrete change in communities now.